The Knockout Is A Beer Shotgun, Water Bong, And Gravity Bong All At Once! | OhGizmo! 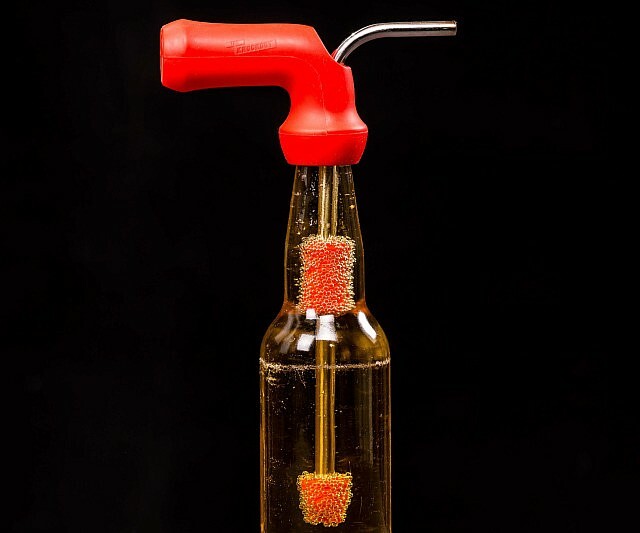 The Knockout Is A Beer Shotgun, Water Bong, And Gravity Bong All At Once! So here’s a product that will do well. The Knockout is an attachment that goes onto your beer bottles and allows you to chug one in a couple of seconds, shotgun style. It does this by creating an air-tight seal around the mouth of the bottle, and inserting a tube all the way to the bottom; this lets air in and allows the beer to escape freely when tilted over. But that’s not all this product does. There’s an attachment (a one-hitter bowl) that lets you light up some herbs and use it as a regular bong as well, if your beer bottle is filled with water (or beer, we don’t judge). But it gets better. Fill it with water, fill the bowl with party herbs, turn it upside down as you put some fire to it and the vacuum will draw smoke in: it’s a gravity bong! And if you really want to kick things up a notch, do “The Knockout”. That’s when you do a gravity bong with beer. In other words, chug your beer as you light your herbs, only to do your hit once you’ve downed the entire thing. It’ll get the party started in a hurry. As you can imagine, the product is sold out since they’ve had a viral week on the Internets. They’re trying to get shipments going out in January, and it’ll cost you $30 to pre-order it now.